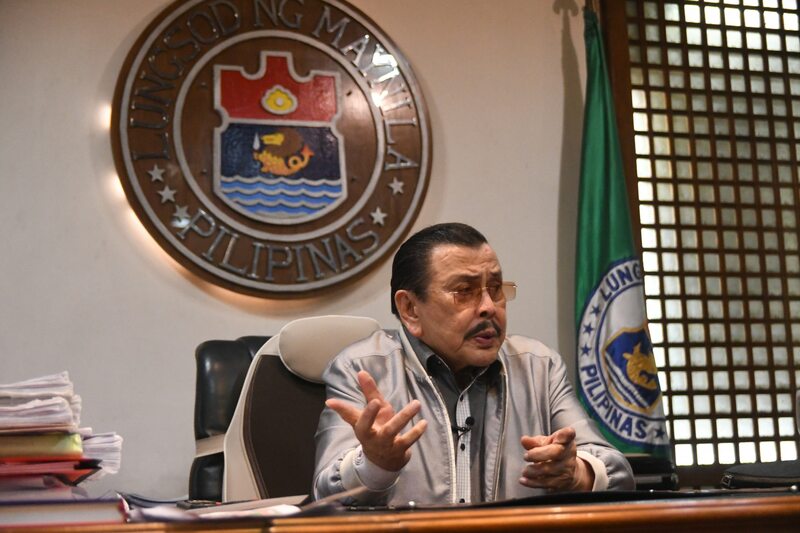 MANILA -- Joseph Estrada walked to his office at the coffin-shaped Manila city hall compound with a pronounced limp, settling gingerly in his desk before mumbling instructions to an aide. The mayor of the Philippine capital will turn 82 years old next month, the political dynasty he built in neighboring San Juan City marking half a century as well later this year. The former movie actor isn’t retiring yet, despite his age and a blockbuster political career that brought him all the way to the presidency. Not even if he is already on his 6th year as Manila mayor, a post he sought partly because he didn’t want his career to end in defeat. 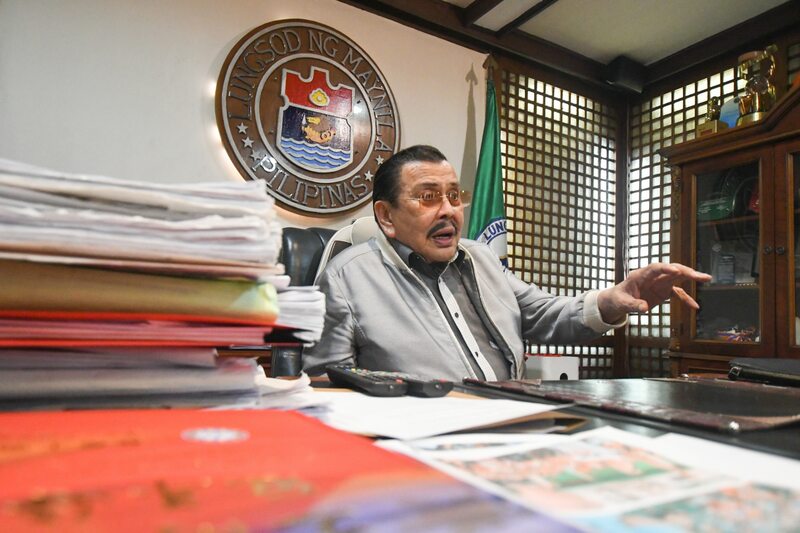 Estrada is making one final push, gunning for another 3-year term, with a victory cementing the expansion of the family dynasty in the city where he was born. "It’s really a gamble, but hopefully, with God’s help, we’ll be successful," he told ABS-CBN News. 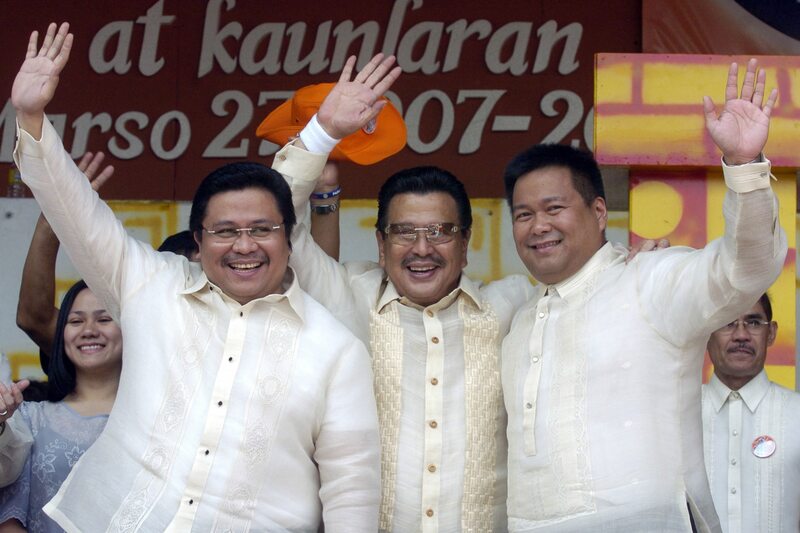 Estrada lost in the 2010 presidential election to Benigno 'Noynoy' Aquino III, but placed a strong second with more than 9.4 million votes. The man — ousted 9 years earlier on corruption allegations and subsequently convicted of plunder — had kept his loyal following. In 2013, he ran for mayor in Manila insisting it would be his "last hurrah" in politics. He broke that promise 3 years later, antagonizing some of Manila’s well-entrenched political leaders. The stakes are high in the upcoming elections for one of the country’s most colorful and enduring political dynasties. Estrada, the family patriarch, isn’t getting any younger. And as in any other political dynasties, problems usually emerge once "the first generation goes," said Ramon Casiple, executive director of the Manila-based Institute for Political and Electoral Reform. The next generation of rulers, Casiple said, usually "unravels," partly driven by personal ambitions within the vast political network, leading to disintegration. 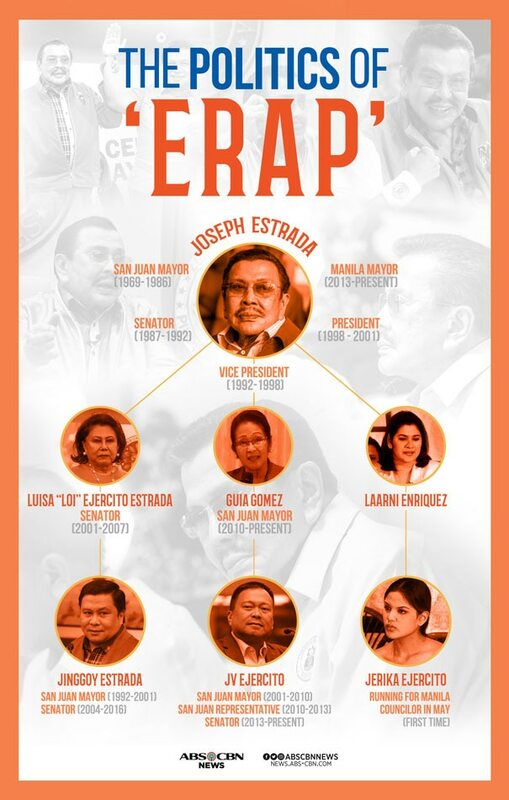 In the case of the Estradas, it’s the old man who was clearly keeping the dynasty together, especially with the deep-seated acrimony between his sons, half-brothers Jinggoy Estrada and JV Ejercito. "Talagang each would go his way ‘pag nawala si Erap," Casiple said. There’s no shortage of Estradas in the May elections. 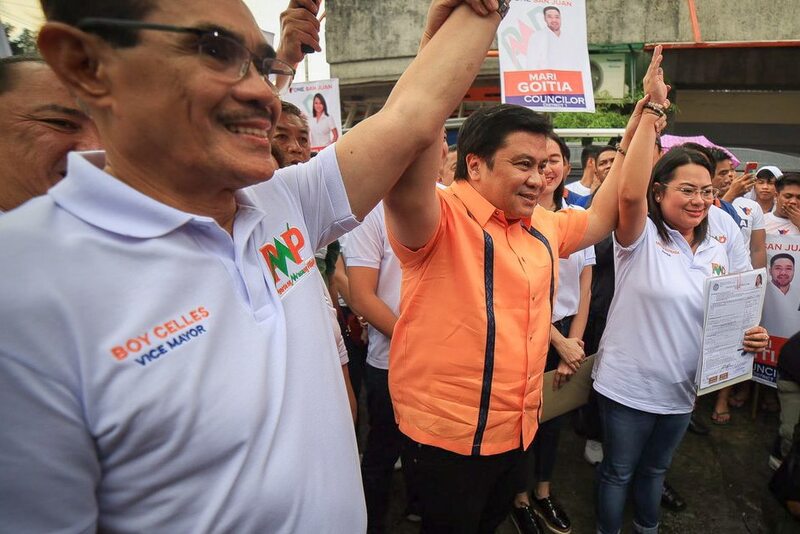 Aside from the family patriarch, Jinggoy Estrada is eyeing a return to the Senate, claiming that a victory would “vindicate” him from allegations he plundered P183 million from his pork barrel as a senator before. He is out on bail. 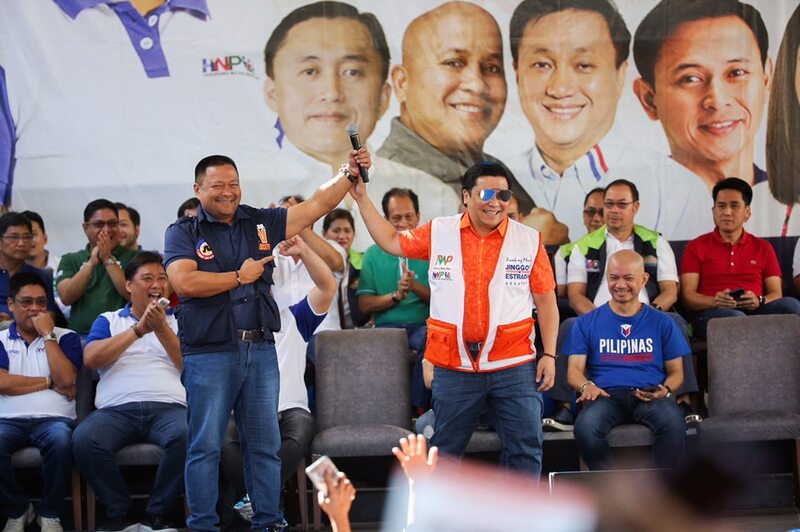 Sen. JV Ejercito is seeking a fresh mandate in an election bid that is further complicated by his half-brother—arguably the more popular of the two—running for the same position. Jinggoy Estrada’s daughter Janella is a mayoral candidate in San Juan, attempting to succeed JV Ejercito’s mother, outgoing Mayor Guia Gomez. Joseph Estrada’s daughter with former screen actress Laarni Enriquez, Jerika Ejercito, is running for Manila councilor. Isko Moreno, a former vice mayor and one of the city’s 3 mayoral candidates, believes Jerika Ejercito was being groomed to take her father’s place. “Wala na ba talaga tayong delicadeza sa buhay? Wala na ba tayong kahihiyan? Tapos ang gagahasain natin ay yung salitang demokrasya,” Moreno told ABS-CBN News. Estrada insisted his was never a dynasty, arguing that he and his family did not inherit positions but won fairly in a democratic exercise. "It’s the people who have the last say. The people are the ones who voted for you... that is democracy, not monarchy," said the former actor, repeating a line also often echoed by Jinggoy Estrada. JV Ejercito supports a ban on political dynasties and was among those who introduced such a prohibition among candidates in youth elections. But he is running just the same. Francis Zamora, who is challenging Janella Estrada for the San Juan mayoralty, is predicting a tough fight for Estrada candidates in May. "They’re doing this at a time when they may not be as strong as they used to be," said Zamora, who belongs to another powerful political family in San Juan that used to be allied with the Estrada. "Masusubukan dito ang pamilya nila kung gaano kalakas pa sila politically at gaano kalakas pa yung following nila." 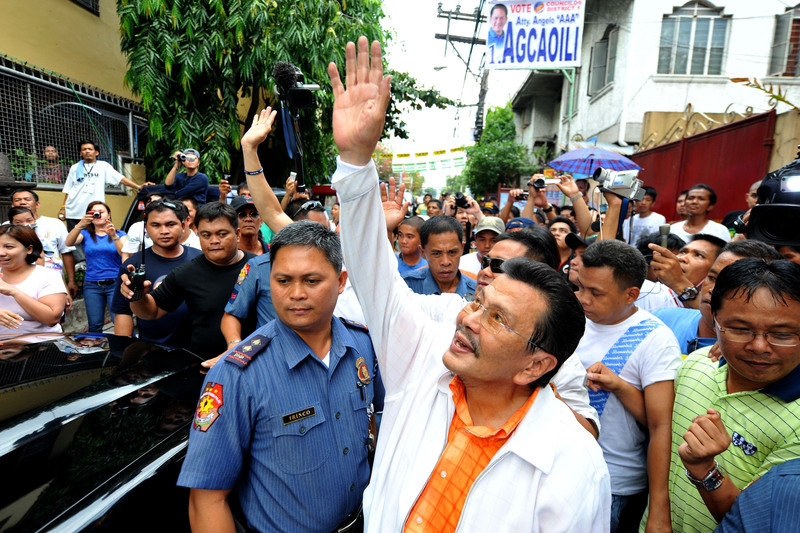 The dynasty began in 1969 when Joseph Estrada won his election protest and assumed San Juan’s mayoralty, parlaying his movie star fame into what would become one of the Philippines’ biggest political success stories. Estrada dedicated the victory to his newborn son with Guia Gomez, a former actress, and named him Joseph Victor or JV. The Estradas have been firmly in control since, keeping political power within the family and a few allies, particularly the Zamoras. Casiple said Estrada’s political brand was typical of the patronage politics prevalent throughout the country. "He is somebody who is very generous to his supporters pero delikadong makalaban (but he is a dangerous enemy)," Casiple said. But this same dynastic politics, he said, transformed a small, backward municipality into one of Metro Manila’s most progressive cities. "His real legacy is San Juan," Casiple said. "I don’t think he made a mark in Manila in terms of legacy."